Set on a windswept hillside overlooking Scapa Flow is what is probably the UK’s most northerly straw bale house. At the stage of being wind and weather tight but not yet plastered internally, this is an example of a self build house with very low embodied energythe total amount of energy it takes to make a material (or a building). See more on embodied energy. 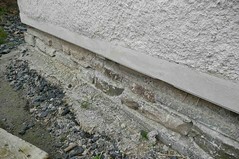 Even the footings avoid using concrete, being made of a base wall of local stone. Designed to incorporate passive solar, the south facing windows are large and the first floor ones are partly shaded by the roof to avoid overheating in summer. The structure incorporates a timber frame and a balcony will be built on at first floor level. The roof has generous overhangs to help protect the walls, including the joinery of the windows and doors. 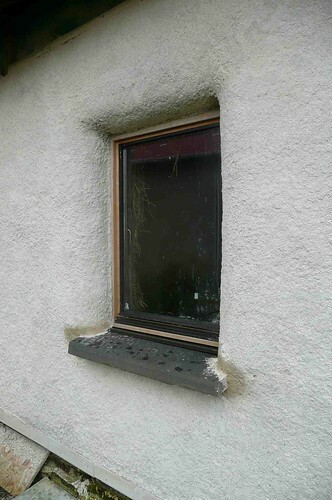 The window and door jambs have the characteristic curved edge of straw bale buildings. This creates window reveals which admit more light and broaden the view from inside. The driving rain in this sort of location will provide a test for the quality of the harling. Even a relatively small ingress of water could lead to conditions of rot in the straw. Next to the new house is an interesting example of a traditional stone slab roofed cow shed. Hi, im looking into self building a straw baled house. Still undecided about whether im going to use wood or steel as the main framing. I’d also like to know if you placed doors and windows according to bale length spacings and how you connected the bales together. Did you build full double height with bales or build the 1st floor walls on a weight bearing shelf connected to the corner posts. What adobe/clay did you use for plastering the outside of the bales. Also any problems you came up against would help a lot. 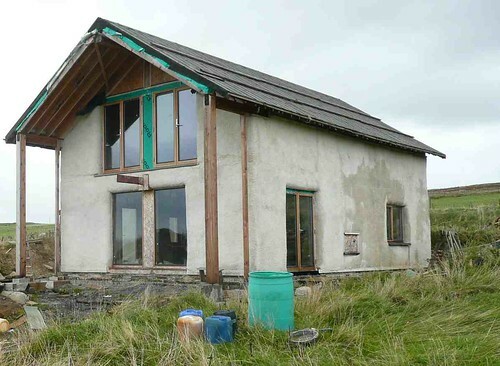 I have a plot of land in Lyness Hoy and would like to build a straw bale house.Will it be possible to get more information about this beautiful house pictured above. We are interested in building a eartbag/sand bag therapy centre for the special needs community and our (www.thecentreofhopeandlight.org)house in orkney. We are coming to Orkney for a holiday arriving Sat 22/10/11 leaving Sat 29/10/11 We would love to meet up with yourselves or the owners of the building to see how it’s done also get abit of advice about planning etc.